Kerala is a long narrow state edged with 360 miles of golden, palm-lined coastline adjoining the Arabian Sea. There are plenty of beaches on offer from secluded coves, to bustling fishing villages and upmarket resorts. It can be difficult to choose which Kerala beach is right for you. This Kerala beach guide takes you through the options, starting in Part 1 with the popular resorts of South Kerala. Kovalam is the most popular Kerala beach resort, conveniently located only 30 minutes south of Trivandrum. This trio of palm-lined beaches was once a budget backpackers hang-out, but has now become very popular with tourists on package holidays, with plenty of upmarket hotels on offer. The development of the resort has been haphazard, resulting in the loss of much of its character. However if you are looking for a wide choice of accommodation and restaurants, and a lively beach scene then Kovalam is for you. Prices are higher in Kovalam than in other parts of Kerala, but budget choices are possible, as well as many luxurious resorts offering ayurvedic treatment. Kovalam and Varkala both have rough seas with strong undercurrents, so you must be careful when swimming, but hiring a boogie board can be fun. Recommended for tourists looking for luxurious resorts, ayurvedic spas and a lively beach scene. Varkala is the second most popular Kerala beach resort, located north of Trivandrum. The beach is spectacularly located beneath steep red cliffs with fantastic views and beautiful sunsets. Varkala is less commercialised than Kovalam, but is no longer quiet. There are plenty of tourists around, and new hotels are being built all the time. However it is a much more relaxed option, with the cliff top lined with chilled-out bamboo cafes and shops. It’s a great place to sit and enjoy the views including dolphins during the day and amazing sunsets later on. There are plenty of opportunities for ayurveda and yoga. 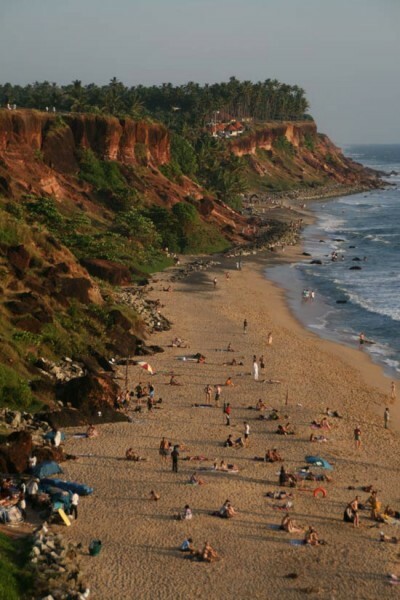 Varkala is only 30 minutes south of Kollam, so is easily combined with a backwater trip. Recommended for those looking for a quieter option than Kovalam, but still plenty of accommodation and restaurant choices. If Kovalam and Varkala both sound too busy for you then there are many quiet stretches of beach south of Kovalam and north of Varkala. You can choose to stay at luxurious resorts or the occasional guesthouse, and are likely to have the beach to yourself with not much else going on. Recommended for those looking to get away from it all, especially tourists who can afford the expensive resorts along the coast. Part 2 of the Kerala Beach Guide covers the beaches of Central Kerala – ideal for those looking to combine backwaters and beaches. If you sign up to the Kerala India Travel RSS Feed, you’ll receive new articles direct to your reader. This entry was posted on Friday, September 4th, 2009 at 2:48 pm	and is filed under Kerala Beach, Kerala India Travel. You can follow any responses to this entry through the RSS 2.0 feed. Both comments and pings are currently closed.